Andrew Walker, Jr., born October 29, 1808, was a pillar of the Kennebunk community in the 19th century. A storekeeper and merchant by trade, he opened a shop in Kennebunk with his brother, Palmer Walker, in 1835. Palmer left the business in 1840 and Andrew continued operating the store through 1888. Walker held the office of Town Clerk between 1844 and 1857 and Town Treasurer from 1847 to 1856. A documentarian, Walker in 1862 recorded enlistments of soldiers from Kennebunk in the Civil War. His record was produced in 1868 and can be found under the title Military and Naval History of Residents of Kennebunk who Enlisted in the Late Civil War. Walker died on July 18, 1899, having outlived his wife Harriet (c.1823 – 1879) and daughter Lucy (1862 – 1886). In 1851, Walker began keeping a diary of daily observations, with his initial entry dated January 1 of that year. His introductory statement reads: “I, Andrew Walker, propose to write a short diary in this book of such events in this quiet village and vicinity as come to my knowledge. By the term events I include whatever may be suggested to my mind at the time of writing, whether of a private or public nature, my own thoughts or the thoughts of others. In short whatever may come apparent, that I shall try to express. 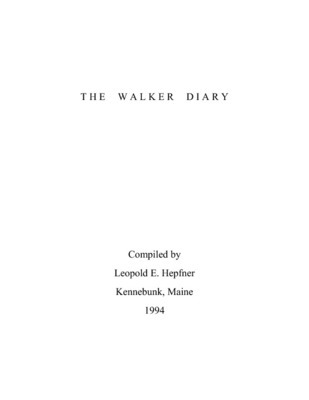 How long the diary continues remains to be seen.” Walker went on to maintain the diary for over 46 years, with his last entry dated August 13, 1897. Walker remained true to his initial scope, recording a wide range of events and interests including weather, politics, religion, poetry, social events and customs, local history, trade, and various other topics. His entries cover town events from Kennebunk and surrounding areas, as well as state- and nationwide events and issues. Additionally, Walker made marginal notes to a majority of his diary entries which provide informal subject headings for each entry. In all but the last volume, he indexed his entries alphabetically by topic on the first and last pages of each book. The Andrew Walker diaries are comprised of eleven books. The first ten are bound in olive green cloth. The eleventh is bound in black and red leather. All volumes measure approximately 34 cm x 22cm. The set was purchased at auction and later donated to the Kennebunk Free Library, where it remains. Volume I of the Andrew Walker Diary. Entries cover January 1, 1851 through April 18, 1852. A separate document titled "Sales of Real Estate in Kennebunk 1845 - 1852" is included at the end of the volume. 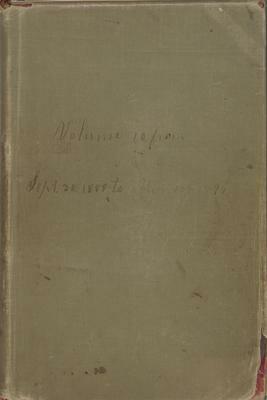 Note that the date range written on the front cover is January 1, 1851 - April 19, 1852. Volume II of the Andrew Walker Diary. Entries cover April 19, 1852 through July 21, 1854. 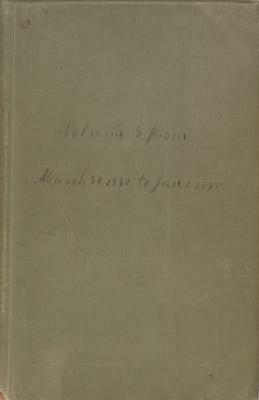 A page titled "Monetary" appears after the last diary entry and contains a short list of transaction information from 1852 to 1865. 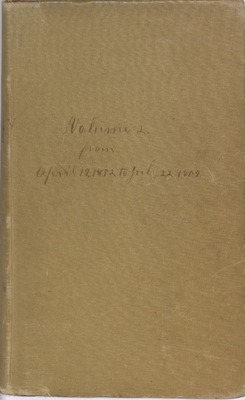 Note that the date range written on the front cover is April 19, 1852 - July 22, 1854. Volume III of the Andrew Walker Diary. Entries cover July 22, 1854 through February 17, 1858. 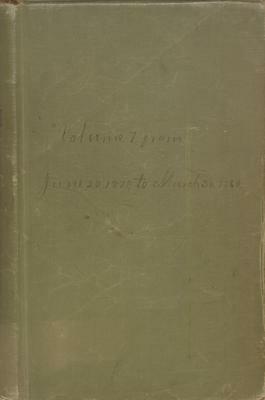 Note that the date range written on the front cover is July 22, 1854 - February 18, 1858. Volume IV of the Andrew Walker Diary. Entries cover February 18, 1858 through November 2, 1862. 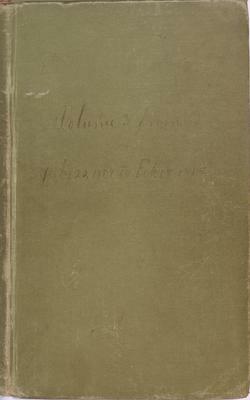 Note that the date range written on the front cover is February 1858 - November 3, 1862. The is the only volume in the set that contains orange and black printed lining papers and a manufacturer's label of Oliver Holman, manufacturer and stationery dealer of Boston. Volume V of the Andrew Walker Diary. Entries cover November 3, 1862 through April 10, 1869. Volume VI of the Andrew Walker Diary. Entries cover April 11, 1869 through June 20, 1875. 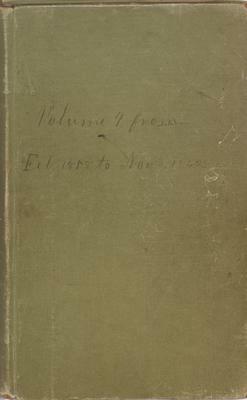 Note that the date range written on the front cover is April 10, 1869 - June 20, 1875. This volume contains a manufacturer's label on the inside front cover from B.F. Bennett & Co., stationer of Boston. Volume VII of the Andrew Walker Diary. Entries cover June 22, 1875 through March 29, 1880. 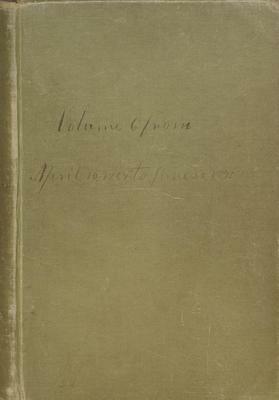 Note that the date range written on the front cover is June 20, 1875 - March 30, 1880. This volume contains a manufacturer's label on the inside front cover from Hall L. Davis, manufacturer and stationer of Portland, Maine. 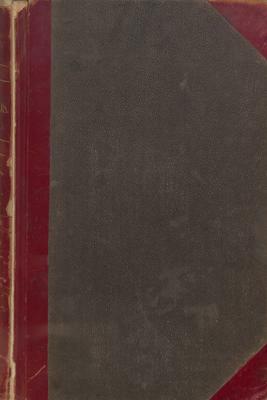 Volume VIII of the Andrew Walker Diary. Entries cover March 30, 1880 through December 31, 1884. 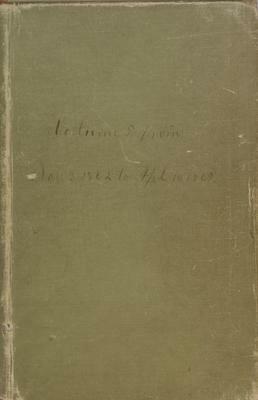 Note that the date range written on the front cover is March 30, 1880 - January 1, 1885. This volume contains a manufacturer's label on the inside front cover from Hall L. Davis, manufacturer and stationer of Portland, Maine. 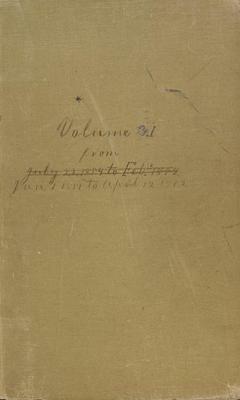 Volume IX of the Andrew Walker Diary.Entries cover January 1, 1885 through September 29, 1889. Note that the date range written on the front cover is January 1, 1885 - September 30, 1889. This volume contains a manufacturer's label on the inside front cover from Hall L. Davis, manufacturer and stationer of Portland, Maine. Volume X of the Andrew Walker Diary. Entries cover September 30, 1889 through March 17, 1894. Note that the date range written on the front cover is September 30, 1889 - March 18, 1894. This volume contains a manufacturer's label on the inside front cover from Hall L. Davis, manufacturer and stationer of Portland, Maine. Volume XI of the Andrew Walker Diary. Entries cover March 18, 1894 through August 13, 1897. 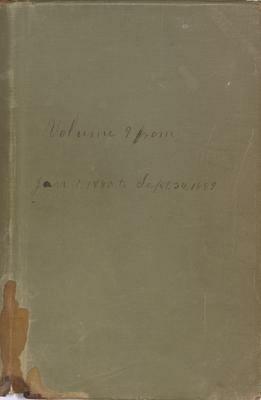 No date range appears on the cover of the volume. This is the only volume of the set that does not have a matching green cloth cover and binding. A manufacturer's label is contained on the inside front cover from Hall L. Davis, manufacturer and stationer of Portland, Maine. This volume is the only one of the set that does not contain an index. The handwriting is noticeably more unclear toward the latter years of daily entries.The last daily entry ends on page 247. An essay or article titled "Ship Carpenters Wages in Kennebunk District from 1849 to the Present Time" appears on page 248. This article is undated and is written in an unknown hand. A second essay or article titled "Ten Hour System in Kennebunk" appears on page 252. This article is also undated and in an unknown hand.